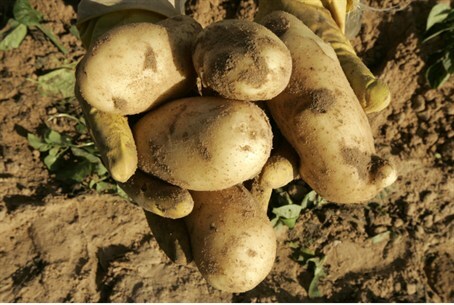 Farmers and wholesalers in Jordan have demanded that the government stop imports of potatoes originating in Israel. Farmers and wholesalers in Jordan have demanded that the government stop imports of potatoes originating in Israel, the Jordanian newspaper Al-Rai reported on Thursday. According to the report, the Jordanian farmers are claiming that the policy of the Jordanian Agriculture Ministry is forcing them to sell their produce at a loss. The reason for this, they claim, is that potatoes imported from Israel have flooded the Jordanian markets and have caused their produce to accumulate. The report added that the Jordanian Agriculture Ministry recently allowed the entry of an unknown amount of shipments of potatoes from Israel, in accordance with import licenses granted to a number of traders. The report quoted a statement issued by the farmers in which they expressed surprise that the Agriculture Ministry did not approve a similar import of potatoes from Gulf countries. The farmers reportedly demanded that priority should be given to agricultural imports from Arab countries. Meanwhile, Jordan is expanding its relations with Turkey, which has recently announced that the port in Aqaba will serve as the main port for export of goods intended for the Persian Gulf. Al-Rai cited “informed sources” who said Turkey’s decision came after the road which was used by import trucks and which ran through Syria was closed because of the riots in the country and the growing tension between Turkey and Syria. Jordan is estimating that at least two ships will arrive in Aqaba each week, carrying 100 to 150 trucks which will continue by land towards the Persian Gulf. It was also reported that the Aqaba port was chosen due to the low fees it charges for services offered.